Today, visitors can enjoy Alexandria's rich history at the Citadel of Qaitbay (where some of the stones used in construction came from the lighthouse), Roman Catacombs, a Roman Theatre and a stunning recreation of the great library of Alexandria. To see the birthplace of Coptic Christianity, visit the St. Mark Orthodox Cathedral, on the site where St. Mark (yes, the one from the Bible) founded a church in 60 AD. Stick with ancient civilizations for a visit to the incomparable Alexandria National Museum and the Graeco-Roman Museum. Or come back to this century and wile away a relaxing vacation day on Alexandria's beaches or on the grass at Montazah Royal Gardens. 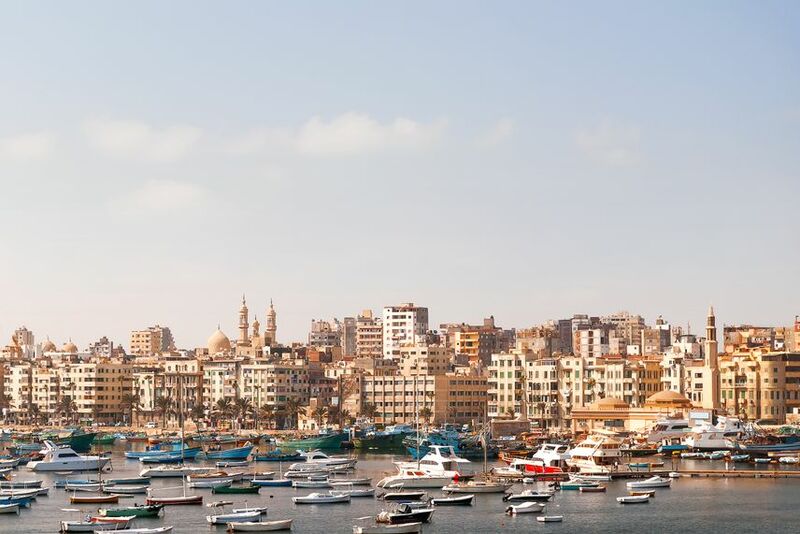 Alexandria is heavily touristed, so can be crowded in high season, but hotels are plentiful and well-priced and there's a restaurant for every budget. My dream city! You must definitely visit this mixture of oriental traditions and European style! The Mediterranean Sea washes Alexandria, giving salty cool and fresh air to the every street, each opened window or balcony. As I have noticed, Alexandria is more clean city than Cairo, ways under houses are from marble or ceramics, gardens are beautiful! Alexandria is right on the water and the home of quite a bit of history, including the ancient library (no longer there) and the Lighthouse, one of the Seven Ancient Wonders. There's good diving, too, but I didn't get a chance to do that. Worked here back in 2003. Stayed at the Sheraton Montaza. The city is a lot cleaner than Cairo. Every room at the had a great view of the Med sea from my hotel room. Visit after Cairo; will seem like a breath of fresh air after the chaos of Cairo. New Library is incredible, plan 3-4 hours minimum and start with the guided tour. Mantazah Palace and Gardens are also beautiful and take time to walk by the sea. Highly recommend lunch at Fish Market-Tikki Grill restaurant on the harbor. Excellent fish and awesome harbor views.